Walt Disney Studios Home Entertainment has announced the release dates for Thor: Ragnarok on Digital, Blu-ray and DVD. The blockbuster will first release to digital formats including Digital HD and Digital UHD (4k) on Feb. 20, followed by Blu-ray and DVD on Mar. 6. So far, we have not heard of an Ultra HD Blu-ray release, only the “Multi-Screen Edition” packaged with a Blu-ray, DVD and digital copy. Disney is promoting their new Movies Anywhere digital movie platform by mentioning the service in their press release. However, as of now Movies Anywhere does not support 4k resolution so you may consider iTunes or UltraViolet partners if UHD isn’t available by release date. In 4k UHD, Thor: Ragnarok is presented in 2160p video resolution with HDR color for improved luminance and color depth. And, the soundtrack is provided in immersive Dolby Atmos for audio systems that support it. Bonus features with Thor: Ragnarok include exclusive never-before-seen deleted and extended scenes, outtakes, gag reel, an exclusive short “Team Darryl”, part three of the mockumentary “Team Thor,” Marvel Studios: The First Ten Years, making-of featurettes, the film’s comic-book origins, 8-bit scenes, audio commentary from Director Taika Waititi, and more. Thor: Ragnarok is the third installment in the Marvel Cinematic Universe grossing over $845M at the global box office. Directed by Oscar-nominated Taika Waititi, the film stars Chris Hemsworth, Cate Blanchett, Tom Hiddleston, and Jeff Goldblum. 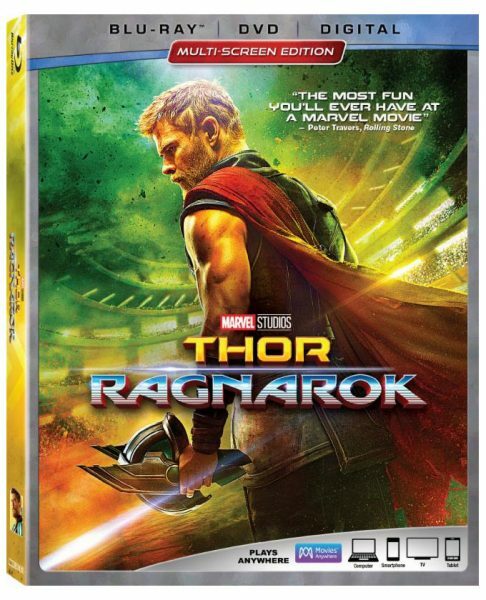 Marvel has multiple versions of Thor: Ragnarok available on-site now.